Sidebars are the interesting part of any WordPress theme because you can extend the site and make it complete by placing important widgets in the sidebars. Custom sidebars a free to use plugin, this plugin allows users to create your own widgetized areas and custom sidebars, and allows you to select what sidebars to use for each post or page. Here are some of the of amazing free custom sidebar widgets for WordPress to handle this task for you. If you like this post, share it with your friends through email and social networks. Related articles you will definitely find worth checking out: Premium WordPress Forum Themes, Free WordPress Alert Bar Plugins, Social Sharing Widgets for WordPress and Translation Ready WordPress Themes. 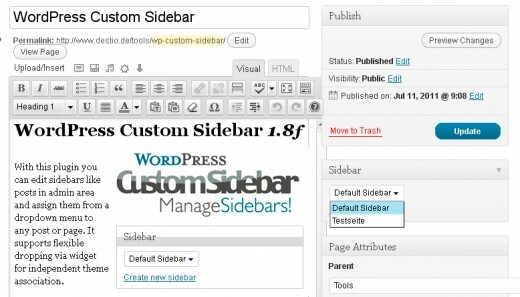 SQUARE Sidebars is a sidebar management plugin for WordPress that allows the users to create and manage custom sidebars directly from the WordPress administration. It aims at giving the users the magic wand to create, manage and replace sidebars. Previous Post:Which WordPress Plugins Should Every Business Have?